We interrupt the series of CFMoto scooter reviews to bring you a review on the 2010 Hyosung MS3-250. Partsforscooters.com works with Sargents Motorsports out of Portland, Oregon in order to provide product reviews to over 2,000 of our valued wholesale dealers. Let's take look at the history behind this company just so everyone's familiar with them. S&T Motors Co., Ltd. (Korea) established Hyosung Motors & Machinery, Inc in 1978 and a short year later formed an agreement with Suzuki Motors (Korea). They've grown exponentially and with the release of their GT series street bikes in 06', they quickly became a major threat to the big guys in the global motorcycle industry. Proprietary engines, modern design concepts and quality units are fueling Hyosung's growth while keeping them heavily steeped in R&D. Although they've been in the European, African and South American markets for over 20 years, 2010 looks like a kickoff to an exciting decade. S&T Motors has expanded its presence in the U.S. by establishing Hyosung Motors America. It's stated that Hyosung U.S. entered into a joint venture agreement with Chongqing Yinxiang motorcycle factory for parts supply. Hyosung Korea actually formed a partnership with Chongqing Yinxiang in 2002 for the supply of semi-complete units and assemblies. The parts supply for their U.S. based company is direct support expansion that should work in their favor. The MS3 line of scooters from Hyosung landed in 2007 with the 250cc as well as a 125cc version. The 125cc was eventually dropped and the MS3-250 now reigns supreme as the largest scooter Hyosung makes (at this point). It's powered by a water-cooled 249cc single cylinder DOHC engine with an output of 25hp @ 8500 RPM. The motor itself is a hybrid and seems to be a mix of a Kymco and Honda design. This is a very light scooter at only 341 lbs. and rolls on 120/70-13 front and 140/60-14 rear tires. 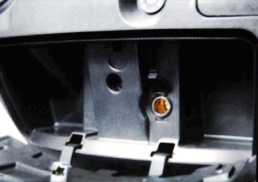 Disc brakes are standard on the front and back. Those, along with a dual rear shock set-up, compliment the size of the bike. MSRP is $4,499 and it comes in black, blue or silver this year. Above standard features and quality assembly are giving this scooter a good name. Let's see for ourselves what this bike is all about. The storage is excellent with enough room under the seat for a full-size helmet and then some. Our Scooter Seat Storage Pouch fits perfectly under this seat. This scooter also has a glove box with accessory "cigarette lighter" plugs. It might not sound like much to customers at first, but a reminder that it'll come in handy for when they need to charge their cell phone and iPod on the go is a good selling point. If your sales person finds that they might be running multiple power applications then a nice product to recommend is our 169-4 Current Stabilizer. It will ensure that they have adequate electric supply to components that need it without any of those nasty power surges. The dashboard has L.E.D. turn signal indicators and an L.E.D. oil gauge alert light. 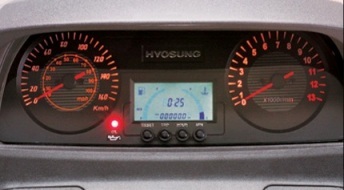 The digital gauge displays fuel and water levels, as well as a clock and trip timer. My only issue with the dash is the fact that m.p.h. is secondary to k.p.h. on the speedometer. Yeah, yeah, yeah I understand most of the world is on the metric system, but we aren't so... please guys, make a distinct version for the U.S.
Hyosung states that this scooter is highway ready and although they are correct with this statement, the overall weight of the scooter has potential to be an issue from vehicle wind gusts. An extra passenger would help, but mentioning that to them is probably not the best idea. Just grip a little tighter I guess. The seat is hands down the most comfortable one I have ever had the pleasure of parking my rear on. It has dual back rests, so your passenger can roll in comfort too. The support feels like there was significant effort put in to ensure a comfy and "well adjusted" ride. Jack at Sargents doesn't like the seat, but I think that's just because he's old and grumpy (haha, we have to give him a hard time). Fit and finish is up to par and the overall quality is good. It's progressed well from the 08' model, which I thought was a little snub nosed. The 2010 MS3 is sleek and stylish with a sporty feel. Turn signals were designed into this look, but due to new D.O.T. regulations this year Hyosung had to bag the rear turn signals and attach a wider replacement set to the rear mud guard. So now the O.E.M. rear turn signals are void of their actual lights, but it works and got them into the country. We're not going to fault Hyosung for that one (this year at least). Easy fix though is to rewire the existing lines, plug in an L.E.D. bulb and make use of the uber cool turn signals on the bike. Last thing I have to say about the overall style is the mirrors. I'm a sucker for good mirrors and the stock set doesn't disappoint. Fully adjustable and they don't slip away from their set position... very nice. The bike started right up and has a throaty sound to it just like a good 250 should. The ride on the MS3 is comfortable and balanced without that "Cadillac" feel that can come from other scooters in its class. I started off easy, but what I really wanted to do was just open it up, but this one only had .1 miles on it, so I played fair, at first. Brakes are A-OK and were adjusted well from the get go. I have to say that the seat really does its job (I know, I can't get over the seat). I've noticed that with a lot of scooters there is a tendency to slide forward when braking hard, but I was staying put. The position of my knees felt like that of a lot of other Korean bikes I've ridden, but it wasn't uncomfortable. The drive also has nice forward foot rests, so stretching out on a long journey is no problem at all. Handling is excellent and on this particular day there were a lot of wet patches with no instances of slipping. Low end is awesome and it handles traffic with ease. No complaints about acceleration from mid-range to high as it seems the torque pushes smooth and there's always available power all the way through. The windshield does an ok job for its size. It wouldn't hurt to put a larger windshield on since you'll feel the need to get out on the highway with this thing. Many of the parts from the Honda CN250/CFMoto 172mm can cross over and we have most of them, but make sure to have your techs pay extra attention to measurements. 23x18 roller weights are the stock size on this engine and we have a large selection of after-market roller weights to choose from. Bottom line on this bike is simple. I like it.... seriously I do. A big thanks to our friends over at Sargents Motorsports for the use of their bikes. They have great customer incentive programs and run a successful repair center. They're always available for dealer to dealer networking and business relationships, so feel free to contact them today! For all manufacturer and distributor bike review requests please contact marketing@partsforscooters.com. Save 25% on our selection of scooter covers. Sale ends June 30th. All new Hoca Carburetor Jets for 150cc and 125cc GY6 engines are here! Part # 114-35 for the CVK Jets, Part # 114-37 for the PWK Jets and Part # 114-38 for Idle Jets. CVK Jets come in 19 sizes that start at 100 and go up to 180. Over 20 sizes for the PWK Jets, from 75 up to 180. Idle Jets come in 9 different sizes ranging from 32 to 70. Order a complete selection of carburetor jets today for your shop! Partsforscooters.com raced in the First Annual 2010 Twist and Gone Scooter Drag races! The races were on May 1st, 2010 at the Brown County Drag way. 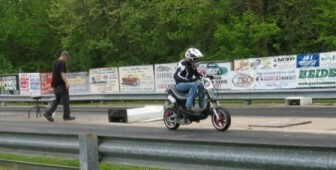 Our one and only Kate Celestian placed 2nd in the 100cc Open class. Kate has been with the company for 4 years now and we were excited for her to race! You can read more about the races on our blog. This is just what happens on lunch sometimes at Partsforscooters.com. 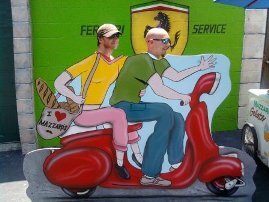 Our employees are "special" and we encourage their enthusiasm for scooters. Friends that scoot together, stay together. * Hyosung 50cc and 90cc ATVs along with a small number of 125cc scooters were imported by the Mosquito Company (Moss. Inc) in 2001 under the Predator name. They both featured Minarelli 50cc and 90cc 2-stroke engines. *Hyosung also manufactures under the Kasea brand name. *Chongqing Yinxiang claims to supply Carter Brothers and Kohler engines. 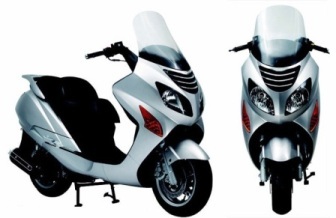 * American Honda Motor Co.’s Powersports Division is releasing two new scooter models in 2011. This includes a 125cc to be introduced in their line-up, the brand-new PCX. 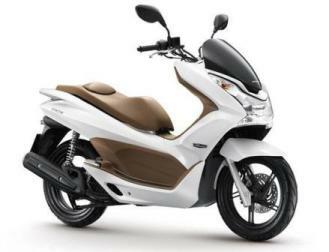 The 2011 PCX is a sporty mid-sized scooter with a 125cc liquid-cooled, fuel-injected four-stroke engine. It will be available in pearl white and candy red. Prices for the new models have not yet been announced. Honda will release additional information regarding all 2011 scooter models in the months to come.